We offer lessons and training in a variety of disciplines, with a focus on building the harmony between horse and rider. Whether you want to learn the basics, fine tune your riding skills on your horse or ours, or work towards the next level in your riding and showing career, we are here to help. 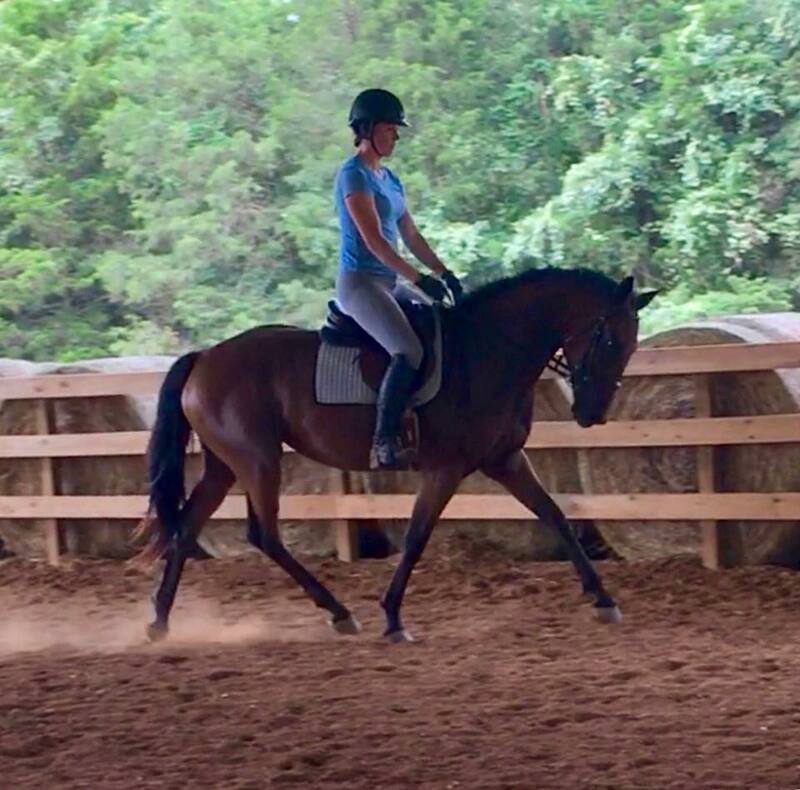 Lessons and training are available in dressage, hunter/jumpers, and equitation, as well as working with the casual rider and their horse to help them achieve their goals. Interested in learning more and don’t have a horse? We have several horses available for lessons and lease on site to let you get your feet wet before committing to a horse of your own. In addition to hosting events on our property, the AEC team travels to off site events such as Hunter Paces, shows, clinics, and more. If there’s an event you are interested in attending, just let us know and we’re happy to work with you to make it happen. In addition to cash and checks, we also now take PayPal! You can purchase lessons or training in advance or buy a gift of lessons! We run various specials and offer individual and packages for training and lessons. Check out our current flyer below for some great deals! We are a full service facility offering the best in care for riders of all disciplines. Whether you're a show rider, a pleasure rider, or a little bit of both, we are happy to help you achieve your equestrian goals. We also have a great facility for shows and events, and offer our arena and some of our amenities for lease if you would like to host your event at our location. Traveling? No problem! We have room for layovers, both equine and human, and even have RV hookups for your living quarters trailer so you can stay on site with your horses. Regardless of where you are headed to or from, we're conveniently located near I-64 and not far from I-95. 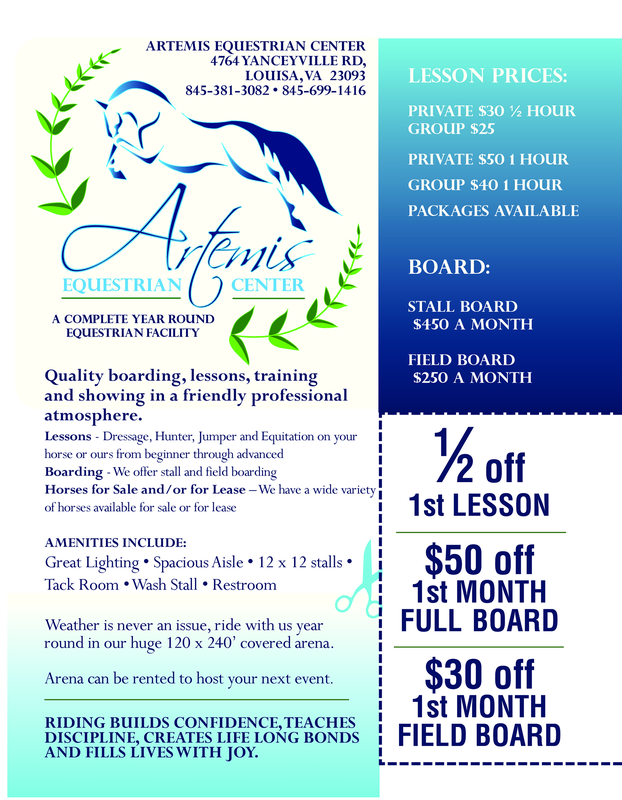 Contact us for more information and to schedule a stop at Artemis Equestrian Center today!